UCLA senior Jessa Culver. (Photo provided by Ms. Culver). Jessa Culver's winning poster project focused on responses to the HIV/AIDS Crisis in Haiti. The UCLA senior plans to pursue an M.D. and M.P.H. in order to pursue a career in global public health. “I first fell in love with the Blum Center as a student of its freshman cluster course called ‘Poverty and Health in Latin America.' That course opened my eyes to how poverty and other socioeconomic determinants disparately affect health outcomes in one of the most inequitable regions of the world. It inspired my interest in global health and passion for health equity." UCLA International Institute, November 16, 2016 — Jessa Culver (UCLA 2017), an international development studies major who is pursuing a minor in public health, has won second place in the undergraduate 2016 Global Health Program student poster contest of the Association of Pacific Rim Universities (APRU). The prize of $100 was officially awarded via at the annual APRU Global Health Program Workshop held at the University of New South Wales in Sydney, Australia, earlier this fall. Culver, who is currently attending UCLA’s CAACP Program in Washington, DC, was represented at the conference by Mellissa Withers of the USC Institute for Global Health, who is program manager of the APRU Global Health Program. 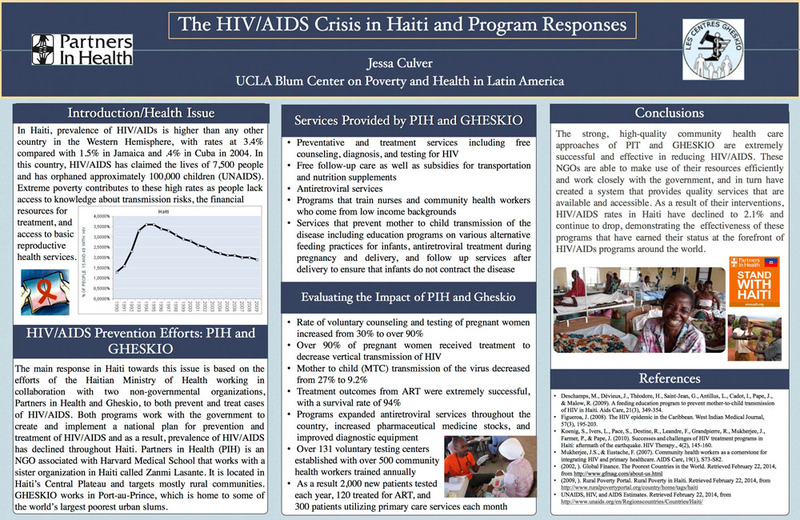 The UCLA student’s poster, submitted on behalf of the UCLA Blum Center on Poverty and Health in Latin America, explains the HIV/AIDS crisis in Haiti and the successful prevention efforts of two nongovernmental organizations there. “From the international development perspective, I was interested in looking at how poverty, or one’s socioeconomic status, affects one’s health,” explains Jessa about her project. “Since Haiti is one of the poorest countries in the Western Hemisphere, it seemed like an [instructive example] to explore how certain factors — such as lack of infrastructure and high rates of poverty — contribute to health outcomes. Winning APRU poster prepared by Jessa Culver. “The issue of HIV/AIDs prevalence is a great example of how factors beyond an individual’s behavior can determine health,” she continues. “I was happy to come across the work of Paul Farmer, whose NGO Partners in Health (PIH) demonstrates how one intervention, clinic or program can have a significant impact at the population level if carried out intentionally and with the involvement of the community itself. Jessa became convinced that global health was her path early on at UCLA. During the 2015–16 academic year, the UCLA senior worked as an undergraduate research and assistant at the UCLA Blum Center. “I first fell in love with the Center as a student of its freshman cluster course called ‘Poverty and Health in Latin America,’” she says. “That course opened my eyes to how poverty and other socioeconomic determinants disparately affect health outcomes in one of the most inequitable regions of the world,” she continues. “It inspired my interest in global health and passion for health equity. Although Jessa’s winning poster was based on desk research, she says, “Without being ‘on the ground,’ I still felt very connected to pertinent health issues while working at the Blum Center.” Not that the UCLA student hasn’t had relevant field experience. After her freshman year in the cluster course, she worked on a public health project in Peru over the following summer. There, she says, “I went with a team to various Quechuan communities, teaching about water-borne illnesses and distributing water filters to each household. Like many UCLA students and alumni who have done public health work abroad, Jessa now hopes to pursue both an M.D. and M.P.H. Eventually, she shares, “I hope to work clinically in a disadvantaged area — whether in Haiti, Peru or even locally, as these issues pertain to pockets around California — and use my knowledge at the individual level to help inform public health projects.” How exactly she does that, says the UCLA senior, will be influenced by her future studies, personal growth and further experience in public health. Open a full-size image of Jessa's poster here. Founded in 1997 by the California Institute of Technology; the University of California, Berkeley; the University of California, Los Angeles; and the University of Southern California, APRU is a network of research universities located in the Asia-Pacific region that seeks to shape the future of higher education and research in the region, create global leaders and develop solutions to common challenges in the Asia Pacific. Today, APRU members comprise 45 research universities on both sides of the Pacific Ocean. In addition to being a founding member of APRU, UCLA is an active participant in the body. UCLA Chancellor Gene Block currently chairs its Steering Committee and UCLA Vice Provost Cindy Fan co-chairs its International Policy Advisory Committee. APRU established its Global Health Program in 2007–08 to leverage the global health education and research of its members to address public policy issues. The program, which is hosted by USC, consists of an interdisciplinary group of faculty and students from Pacific Rim universities.